Yoga is a healthy activity for kids and adults of all ages. 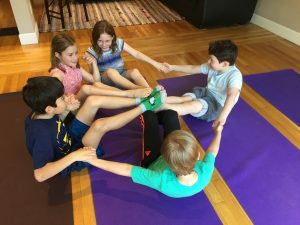 At Creative Roots, kids enjoy Yoga Calm® inspired classes, led by Yoga Calm certified instructor, Monique. Learn breathing techniques, yoga poses, enjoy games and relaxation. This class is designed to support the social and emotional development of kids ages 6-11. Students begin with developing and expand on a practice with breathing, poses, flow of poses, mindfulness and slowly learn how to integrate their practice in their daily lives at school, in their families and at work.